Просто книжка по теме, жаль не поделиться. This is a revised edition of Morris' earlier work which exposed the realities of how 700,000 Palestinians became refugees during the 1948 Arab-Israeli war. 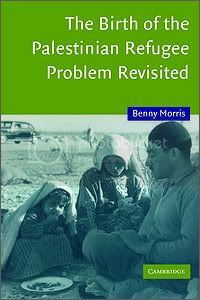 Benny Morris’ The Birth of the Palestinian Refugee Problem, 1947–1949, was first published in 1988. Its startling revelations about how and why 700,000 Palestinians left their homes and became refugees during the Arab–Israeli war in 1948 undermined the conflicting Zionist and Arab interpretations; the former suggesting that the Palestinians had left voluntarily, and the latter that this was a planned expulsion. The book subsequently became a classic in the field of Middle East history. The Birth of the Palestinian Refugee Problem Revisited represents a thoroughly revised edition of the earlier work, compiled on the basis of newly opened Israeli military archives and intelligence documentation. While the focus of the book remains the 1948 war and the analysis of the Palestinian exodus, the new material contains more information about what actually happened in Jerusalem, Jaffa and Haifa, and how events there eventually led to the collapse of Palestinian urban society. It also sheds light on the battles, expulsions and atrocities that resulted in the disintegration of the rural communities. The story is a harrowing one. The refugees now number some four million and their existence remains one of the major obstacles to peace in the Middle East.